Quite a sobering sight to see workers removing the Christmas decorations from the trees along Orchard Road. A stark reminder that the new year has begun and the whole rat race will begin again quite soon. If the general crowd on the streets are an indication of this, the town area was strangely quieter than usual even during the lunch hours. If this are a sign of things to come from our media industry for the year 2008, I gladly welcome the new openness towards issues. What a wonderful way to start a new year! Some of these days, it’s going to flood real bad. The rain has been coming in random and unpredictable flash storms. Almost five or six of them in the past few hours or so. Crazy stuff. On the hindsight, the weather has cooled down considerably. Welcome December. 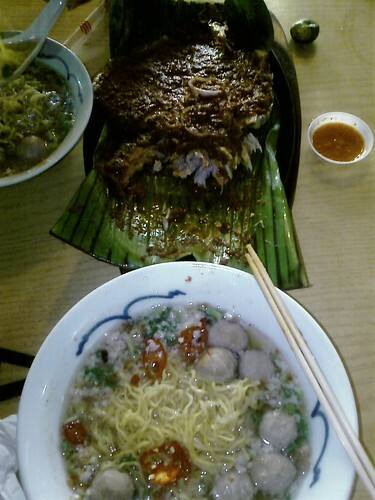 Bak Chor Mee + Sambal Stingray, originally uploaded by jeremyfoo. Nothing beats food like Singapore food. A most awesome supper, albeit on the other side of the island. My tummy doesn’t care though, its just happy. Its so ironic that everything that’s said in the video is being totally refuted by the absurdity of the video itself. Its like a huge oxymoron. I have never been more ashamed to be working in the technology sector than it is to be a Singaporean. For all the good of the government here, information technology apparently seems to be their biggest downfall. From the really ridiculous contracts they hand out to companies that provide substandard work, to the trends that they want to promote, to the policies that they implement, they don’t seem to get it right. Even worst, they don’t seem to factor in the fact that its not always the academics that get it right. Maybe its the lack of knowledge in this particular field of social technology that is fast becoming the mainstay of many, or the plain ignorance of the fact that its not something that you can just glean off academics, or it could just be the old fashion ideas that the screw ups, or the ones who don’t follow in their ideal way of becoming successful, actually would be the ones they have to contact in this field. The worst part about this video is that it has been featured on TechCrunch. And reading the comments that has now been associated with this particular video, you get the general idea that perhaps to the public, MDA is just making a video for the fun of it. However, when you realise that its actually something that’s serious, it just becomes a very sad affair. The world is changing, so please, change with the times. We’re still stuck, like MediaCorp, in the Under-One-Roof era. Updated: More comments here and here. Updated 2: In the spirit of social media, parody here. For people who have caught the new comedy series on Channel 5, The Noose, which promises to be the comedy that spoofs television news, I just want to say, switch the TV off. Its a blatant and stupid attempt at doing what has already been done better and perhaps with more interesting content by others. The Daily Show with John Stewart and The Colbert Report both do excellent parodies of current events that it begs the question of whether local television is going down the drain. Without going into the whole mechanics of comedy, the fact that The Noose is irrelevant news makes the whole point of actually watching the show and getting some laughs out of it totally moot. Even with the likes of Gurmit Singh, with his close to being boring portrayal of different whacky characters, on the frontline doesn’t seem to help much to bring the show to anywhere but being lame. Perhaps its because there seems to be a huge drain in quality content on television nowadays, with the executives at the television stations opting to import TV shows and writers being forced to concoct stories from National Day Rally speeches. Come on MediaCorp. Having monopolized the broadcast media, I’m sure you can do better than wannabe and not even up to standard shows. Bring comedy and perhaps TV to the next level please, we’re still stuck in the Under-One-Roof era. I went to this excellent Japanese restaurant this morning with the parents, where I tried the Kamameshi (steamed rice pot). The ambiance was really nice, with Japanese art and calligraphy lining the walls and the dimmed lighting used to effect. What is worth mentioning is certainly the food. The rice was fragrant and tasty, and reminded me a little of our ‘claypot rice’ – just more fragrant. In addition, I was really intrigued with the little hourglass that they provided with the rice pot. Apparently I had to wait for the sand to completely empty before I opened the lid of the pot. Will probably hit the place again sometime soon. Just this morning, I was perspiring while walking along Orchard Road. At the same time, the girlfriend was getting a tan on the beach. Just a couple of hours later, here I am, sitting in my room and listening to the thunder rumbling threateningly outside. 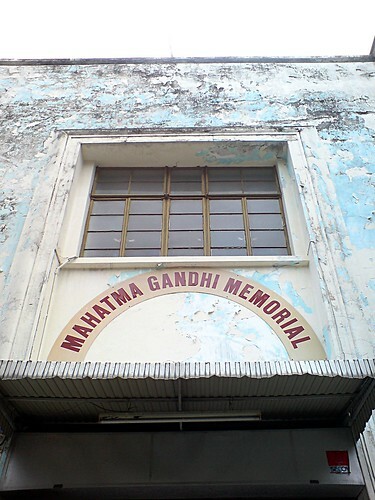 I didn’t realise we had a memorial to Mahatma Gandhi in our city: it certainly isn’t something that gets mentioned in tourist brochures or guidebooks about Singapore.